Importance of Laundry cabinets is increasing by leaps and bounds in the market as attractive furniture is available to enhance the aesthetic appearance by many notches. 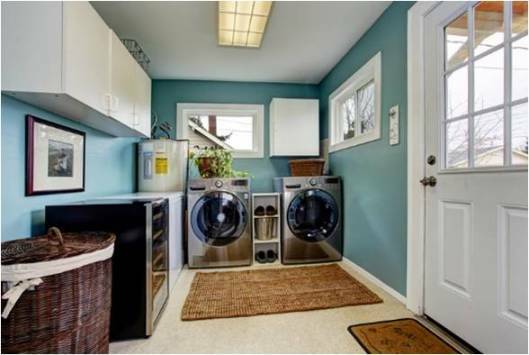 There are many tips and tricks that are used for designing laundry room in an impeccable style. It is important to install a narrow shelf above the counter top in order to create more space for the users. While choosing Laundry cabinets, you will need to clarify the objectives beforehand. One must enquire about the style, location and the appearance of the laundry. If the room where the furniture is to be kept is located in the unfinished basement, you do not need to buy beautiful cabinets. A rugged storage will provide the same solution to the users. In case the laundry room is large and main hub for cleaning, high quality decorative furniture will need to be purchased to accomplish the task. Check whether more space is required to fold the laundry. In such cases, you will need to ensure that base cabinets are purchased. If ironing board is to be placed, purchase special cabinets that have available space. It will go a long way in delivering sterling results to the users. Boards can be slid in and out depending on the requirements and the specifications of the customers. You should decide what type of items are to be stored in the cabinet. The size of the furniture depends upon the quantity and shape of the goods. Cabinets must be styled in a manner that it could accommodate articles of different sizes in an easy and hassle free manner. You should also check what objects are lying around in the laundry and type of cabinets that could be used to prevent cluttering in the open spaces. If the amount of laundry on the floor is large, buy the base cabinets that have pull out hampers. It will go a long way in making the room safer to a great extent. The organization of the cabinet in the form of roll out shelves plays an important role in optimizing the space of the laundry room. Slide out racks are very popular in the laundry for storing the cleaning supplies and items in an impeccable manner. After the purchase of the cabinets, you can install the shelves on your own due to simple manual instructions. If you are using a top loader washer on the wall, you need to ensure that the cabinets do not create impediment in the functionality of the furniture. Generally, the wall storage option is mounted on the top; therefore, check whether the door can be opened in a proper manner. Shelves and cabinets must be placed to ensure accessibility of the people to house detergents. Another important factor that needs to be kept in mind is the quality of the cabinet which can easily withstand the accumulation of the moisture inside the room. Cost is also a very important parameter that will influence the final decision of the customers. Some homeowners prefer melamine coated particle board cabinets that are low on maintenance and cost. Higher quality cabinets are not only durable but they have excellent finishing to boot. Roll out drawers and bins assist in using the available space in an economical manner. They are ideal to store things like hampers in the laundry room. After reading these above mentioned guide, you understand all the necessary things about laundry cabinets. If you want to know more, then keep in touch to get more information.